Russian Opposition Caught Filing into US Embassy in Moscow. May 7, 2012 - In mid-January 2012, just days after Michael McFaul arrived in Moscow to begin his stint as US Ambassador to Russia, Russian opposition leaders lined up outside the US Embassy (Russian) to meet him in a bizarre confab that reeked of both treason and duplicity. Approached by journalists inquiring as to why they had all come to greet the US Ambassador, their responses ranged from silence to dismissive gibes. Later, the group of opposition leaders emerged responding only with "Вы сурковская﻿ пропаганда," or "you’re Surkov’s propaganda," meaning the journalists represented government efforts to undermine their work and legitimacy. It is a common response given by Russia's opposition members when media attempts to question them about their increasingly overt ties to Wall Street and London. Video: This video captured outside the US Embassy in Moscow, Russia, shows prominent leaders of Russia's US-funded, backed, and directed opposition attending a confab with newly appointed US Ambassador Michael McFaul. 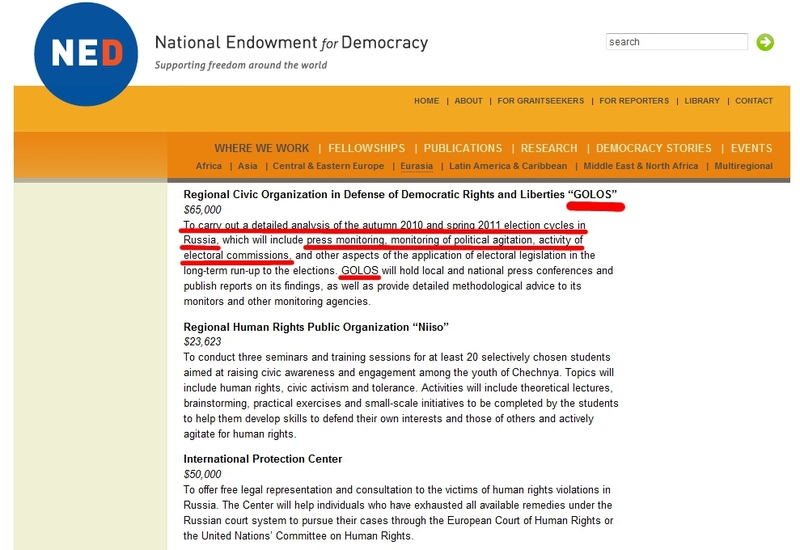 Both the opposition leaders and McFaul himself are directly connected to the US State Department's National Endowment for Democracy (NED). 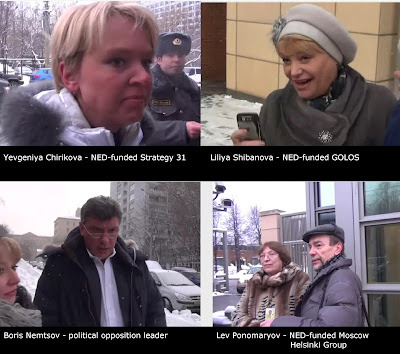 Present at the US Embassy confab were regular mainstays of the Western media's coverage of anti-Vladimir Putin protests, including Boris Nemtsov, Yevgeniya Chirikova of the US State Department's National Endowment for Democracy (NED) funded "Strategy 31," Lev Ponomarev of the NED, Ford Foundation, Open Society, and USAID-funded Moscow Helsinki Group, and Liliya Shibanova of NED-funded GOLOS, an allegedly "independent" election monitoring group that served as the primary source of accusations of voting fraud against Putin's United Russia party. Clearly, this wasn't the first time both words and cash had been exchanged between the Russian opposition and the US State Department, but is perhaps the most overt example of such flagrant conspiring yet. US Ambassador to Russia, Michael McFaul himself, is a card carrying member of both Freedom House and the National Endowment for Democracy (NED), two organizations notorious for extraterritorial meddling in the foreign affairs of sovereign nations and demonstratively funding, supporting, and directing Russia's so-called opposition. It was accurately predicted in October 2011's, "Agitator Nominated for Next US “Ambassador” to Russia," that McFaul's primary goal would be to continue with America's "disingenuous front of “resetting” with Russia, while simultaneously subverting the Russian government with US-funded political unrest." It appears that McFaul has begun his work in earnest. Despite damning exposure of the Russian opposition's ties to Wall Street and London, the Western media, even as recently as this weekend during protests against Russian President Vladimir Putin's inauguration, insists that such connections are the creation of Kremlin-controlled propaganda. The Associated Press in their article titled, "Putin Returns to Presidency in a Changed Russia," accuses Putin of portraying the protesters as "in the pay of the Americans and intent on bringing about a revolution that would take Russia back to the instability and humiliations of the 1990s." AP adds, "with Kremlin-controlled television still the main source of information for most Russians, many believed him." In reality, Putin's assessment of the opposition is verified by the National Endowment for Democracy's own website, the "About Us" pages of the opposition's various websites, and confirmed by confabs conducted by the opposition themselves with foreign interests in foreign embassies on Russian soil. And indeed, many of those leading Russia's opposition are members and representatives of the corrupt oligarchies that plundered Russia after the fall of the Soviet Union in the 1990's. The treason is so overt, it begs the question as to whether the United States has indeed become this recklessly brazen, this desperate, or playing at a broader geopolitical gambit yet revealed. With Russian opposition leaders on video climbing over themselves to get into the US Embassy to confer with regime-change specialist (Russian), US Ambassador Michael McFaul, and as their funding and affiliations become more widely known to the public, their work and legitimacy will be undermined by public awareness of the facts, not "Surkov’s propaganda."